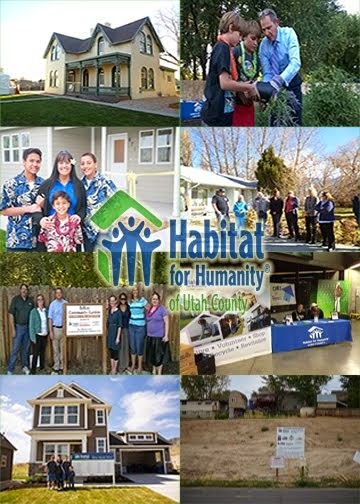 Habitat for Humanity of Utah County: Washburn Reams Estates Construction to Begin in September! Washburn Reams Estates Construction to Begin in September! Habitat for Humanity of Utah County is happy to announce that we are beginning the construction of our Washburn Reams Estates three lot planned unit development in September. Three unique, environmentally friendly homes will be built from the ground up at 525 N 1060 E in Orem beginning mid-September. The Aleman, Fisiipeau, and Evans families have been selected as the partner homeowners on the project. The development being is named in the memory of Mayor Jerry Washburn and City Manager Jim Reams. Both men were wonderful supporters of Habitat and helped us forward our mission in the community prior to their unexpected deaths a few years ago. The planned unit development will be using green technologies with the design and construction. The exterior walls will be built with an environmentally friendly materials, such as concrete blocks or SIPS that will help lower utility costs for the homeowners. The homes are also being designed to be energy efficient with low emissivity windows and 95 percent efficient furnaces and will have as much natural light as possible. Solar panels are also planned for the homes. We are grateful for the generous sponsors who are helping with the design and property improvement stages of the project. These sponsors include Orem City, the Utah Valley Consortium, biome design, Jones Excavating Company, Dynamic Structures and ALM Engineering. We also appreciate our home sponsors to date, including TD Ameritrade, IM Flash Technologies, Nudge, Wells Fargo Foundation and the George S. and Dolores Dore Eccles Foundation. If you would like to help with building materials or subcontractor labor on this meaningful project, contact Nancy at (801) 344-8527 ornancym@habitatuc.org. To volunteer, contact LeAnn at (801) 368-2250 or leann@habitatuc.org.